The International Institute of Peace Studies and Global Philosophy is proposing a 19 Point Peace Plan for Gaza and Palestine and Israel, which has arisen out of the ongoing tragedy of the conflict between Israel and Palestine, especially Gaza, and the need to solve this situation once and for all, to the benefit of everyone involved. The proposal is fair and just to all sides in this conflict and would provide a long term solution to redress the struggle at root source. It can be regarded as an application of a methodology of creative non-violence and equity-creation, reducing fear and insecurity on all sides, and providing a deep-seated security structure for a lasting and permanent peace between two independent, secure, non-violent, autonomous and sovereign states, Israel and Palestine. 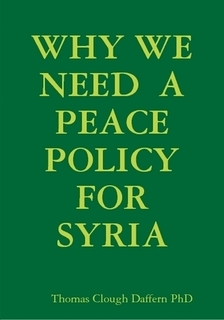 ‘”WHY WE NEED A PEACE POLICY FOR SYRIA” is a pioneering and unique work attempting to define a new field of international diplomacy, called “Peace Policy”. It seeks to apply the ideas behind this new field of practical diplomacy to the test case of the civil war raging inside Syria, one of the most ancient countries on the planet. The book gives practical as well as theoretical suggestions as to how we can end the stalemate inside Syria and advocates some practical steps that can be taken immediately. Event: The 2012 Middle East Festival Forum on Transpersonal History and the Future of Peace in the Middle East. Speaker: Thomas Clough Daffern PhD. Chair: David Lorimer, MA, PGCE, FRSA is a writer, lecturer and editor who is Programme Director of the Scientific and Medical Network and has been Editor of Network Review since 1986. This talk consists of a detailed study of the ideas underlying transpersonal history, a new historical methodology based on combining the findings of transpersonal psychology with those of scientific historiography. Applying the core ideas of transpersonal history to the problematic history of the Middle East, the talk will consider the various competing historiographies and narratives that go to make up the complex mosaic of stories that comprise the historical memories and lineages of thought that people this crowded region. From this perspective, we will then go on to look at the role that competing historical narratives play in framing contemporary conflict and war — how the recent and ongoing wars and violent conflicts in the Middle East are framed and perpetuated by appealing to historical narratives of revenge, justice, retribution, grief and pain. As transpersonal historians however, taking on board the insights of modern thinkers such as Maslow, Rogers, Assagioli, Jung, Wilber, Grof, Sorokin, Buscaglia, and many other leading transpersonal thinkers, we can begin to ask — is there a way that we can rise to a new kind of consciousness, and look down on these past narratives as ancient stories of past hurt and pain, to which we have all contributed, through taking positions that were less than fully representing our authentic potential as self-actualised human beings? We can begin to ask — what would be the implications for the Middle East, and then for the rest of the world if we actually factored in an awakening of consciousness on a mass level, moving away from violence, and towards non-violence, authenticity, love and wisdom as the primary modes of relating to ourselves and others? The talk will also explore how these precise narratives are actually embedded in the ancient wisdom teachings of the Middle East. Finally, the nascent work of the Truth and Reconciliation Commission of the Middle East will also be presented, as arising out of the theoretic work sketched above, and a brief documentary about its work will be shared. We will end with a brief description of the Golden Gate Project. 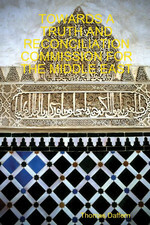 Towards a Truth and Reconciliation Commission for the Middle East has two main purposes, firstly to explain the background behind the launching of the Truth and Reconciliation Commission for the Middle East in 2008, and secondly to give something of the theoretical framework in which this project is being based. Unusual among peace institutes worldwide, the work of the International Institute of Peace Studies and Global Philosophy is dedicated not to the political or military or even economic aspects of peace building, although all such are important – but rather to the causal and metaphysical level of peace building – the building of peace in the collective imagination, the collective will and the collective intelligence of mankind’s warring tribes, nations and religions. It is concerned with the psychological healing and philosophical reconstruction of mankind’s inner life, alongside the outermost socio-economic factors. The launch meeting took place in Israel and Palestine in August 2008 and future annual meetings are being held, also in other Middle Eastern countries such as Lebanon, Jordan, Syria, Egypt, Iraq, Afghanistan, Iran and other Middle Eastern countries. Leading thinkers and intellectuals and visionaries will be interviewed in each country, and their views as to how peace can be best advanced in the entire region will be recorded as testimony to the Commission. The meetings were convened by Dr. Thomas C. Daffern, Director of the International Institute of Peace Studies and Global Philosophy. The project is simultaneously modest and ambitious: its purpose is to help effect an intellectual and spiritual reformation of humanity, at its spiritual heartlands, in which all faiths can live together in peace, humility, love and non-violence.